UFO SIGHTINGS DAILY: Did An Alien On Russian News Crew Cause Birds To Shape Into Putins Face? Aug 2015, UFO Sighting News. Did An Alien On Russian News Crew Cause Birds To Shape Into Putins Face? Aug 2015, UFO Sighting News. Some aliens have the ability to move and shape things, like smoke, clouds, or masses of small things like birds. Sometimes they just think about something and it influences the objects near them to take the shape of their thoughts. They often communicate this way and their telepathic ability is easy for the simple minded birds to intercept and momentarily become part of. What I am saying is that one person with the Russian news station was an alien with powerful telepathic abilities. A video showing the "strange behavior" of birds in New York is going viral after a Russian news station spotted the shape of Vladimir Putin's face in the flock. The video, posted to YouTube by Sheryl Gilbert, purports to show the "strange behavior of birds" flying in a flock near the Brooklyn Bridge. 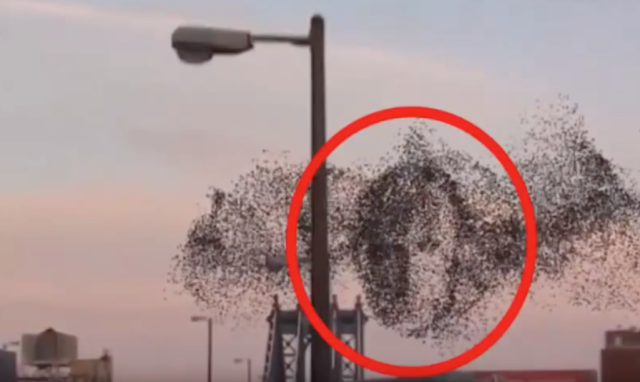 The video went viral in Russia after news station Zvezda aired the footage and reporters said a shape seen in a close-up of the birds appears to be the face of President Vladimir Putin.